Deliver both IPTV and multiscreen services with guaranteed viewing experience at the lowest costs on a single platform, without duplicating your infrastructure. Cable providers are faced with the inevitable need to transform their networks in order to retain their existing subscribers as many households are ditching cable in favor of online streaming platforms. The accelerating pace of ‘cord cutting’ means that cable providers need to deliver their TV to serve not only the set-top boxes but also to all devices that their subscribers prefer. Unfortunately, many solutions force cable operators to duplicate their infrastructure in order to add multiscreen services. This makes managing content very complicated and expensive. 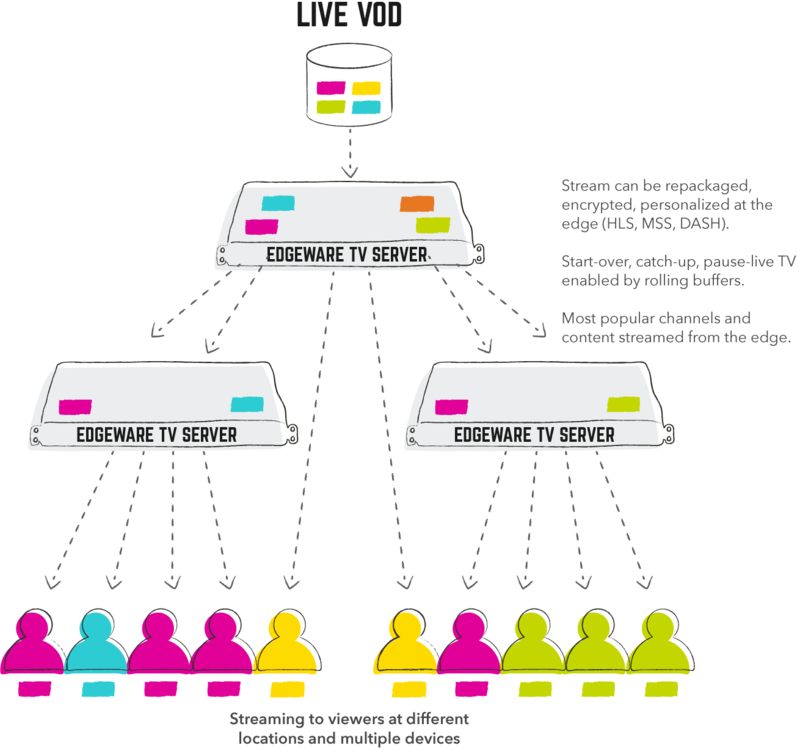 From smart TVs and smartphones to games consoles and legacy set-top boxes connected to QAM tuners, you can cache and deliver your TV content to new and legacy platforms simultaneously from a single consolidated platform. Distributed delivery architecture enables you to scale cost-effectively. This means building a caching hierarchy that can reduce your backhaul traffic by 80%. The fact is that 80% of your viewers watch only 20% of your content. By caching the most popular content and channels at the edge, you are already serving 80% of your viewers. Essentially, you reduce upstream traffic by the same volume. Edge TV Repackaging will reduce backhaul bandwidth even more.